Hello! 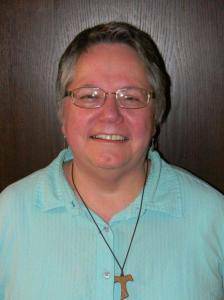 My name is Annie Knakmuhs and I am the parish secretary for the Brainerd Lakes Catholic Churches where I began working in May, 2005. My husband, Mike and I were married in September, 1985 in Montevideo, Minnesota. We have one son, Zachariah (Zach) who attended St. Francis school and who is married to Celina (Hewlett) and who have graced us with two beautiful granddaughters, Felicity Anne and Annalise Rose. Mike & I both grew up in farming families in SW Minnesota. I attended Catholic grade school through 8th grade and public high school in Tracy, Minnesota. I am the second oldest of 11 children. Mike is the oldest of 7 children and grew up on a dairy farm near Walnut Grove, Minnesota. Before beginning employment with the Brainerd Lakes Catholic Churches, I worked for Schwan’s Sales as the N MN Div Secretary for 17 years. I am a professed member of the Secular Franciscans and a member of Christian Mothers. I am an extra-ordinary minister of Holy Communion. I enjoy making rosaries, and we enjoy camping and spending time with family as well as playing cards and visiting with family & friends. At the time I began working for the Church, an employment move was needed and I felt drawn to apply for the opening at the parish. At that time I had two sisters who were employed at different parishes in music ministry, liturgical/pastoral work, and religious education, but I never dreamt what was involved in working in a parish office first-hand. It has definitely been an eye-opening experience for me and I have gained a much higher respect for our clergy and those who work in the parish office for all the behind-the scenes work that is done without the knowledge of our parishioners. Every day brings new challenges and joys and I have never regretted my move to my current position.